In the morning we had to switch hotels, which put us behind schedule, so we caught a taxi to Castelo de São Jorge (Saint George’s Castle). 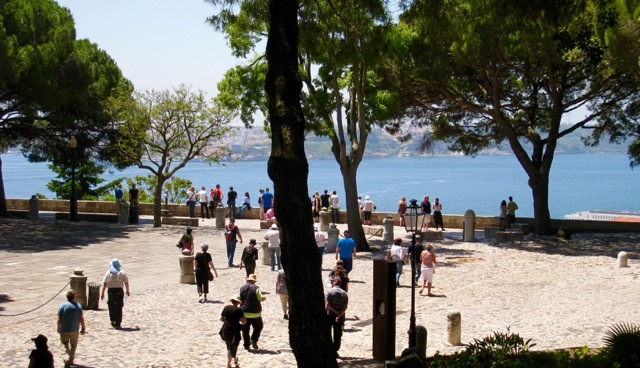 The Moorish citadel, built on a hilltop with commanding views of Lisbon and the Tagus River, consists of a medieval castle, the former royal palace, and a neighborhood that housed the elite. Some of its oldest ruins date back to the sixth century. Since then, it has been fortified by the Romans, Visigoths, and eventually the Moors. The fortification was the last defensive stronghold for those who resided there, particularly the elite. In 1147, Afonso Henriques, Portugal’s first king, with the help of the northern European crusaders, captured the citadel. In commemoration of the Anglo-Portuguese pact of 1371, the fortress was dedicated to Saint George, the patron saint of England. 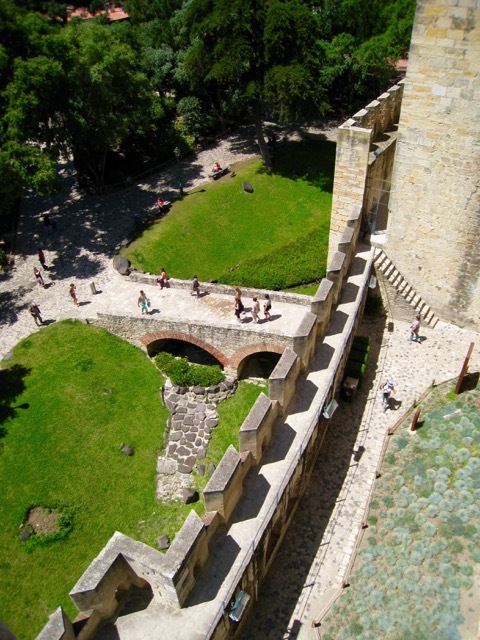 In the thirteen century, the Portuguese kings transformed the castle into a royal palace, and in 1580, when Portugal became part of the Spanish Crown, the castle took on a more important role as a military post. A new fortification was constructed in 1648. 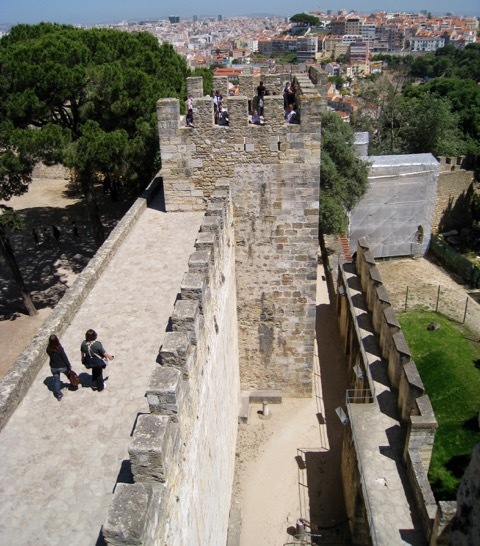 It included a defense wall, which was built around the castle and Lisbon. Since 1673, the fortress has been expanded and added on to over the centuries, until the earthquake of 1755. The devastating quake severely damaged the castle and its outer structures, leaving them in ruins. But it was after the earthquake that the most substantial renovation took place on the old medieval citadel, with many new buildings gradually obstructing older ruins. In the nineteenth century, military installations covered the entire monument area and remained until 1910, when the ancient hilltop settlement was recognized for its invaluable historic importance and declared a national monument. During a major restoration from 1938–40, the castle and the ruins of the former royal palace were rediscovered, and today the medieval grounds have regained their former significance and are open to the public. Between our fading colds, aching calves from hiking up and down the narrow spiral staircase of the Belém Tower, and climbing the many stone stairs at the castle grounds, I declined Dave’s suggestion to detour to the MUDE (Museu do Design e da Moda) on our way back to the hotel. But I soon rethought my decision to visit the modern museum of design and fashion, my love for anything modern overshadowing my aches. However, when we entered the building, I was more interested in the structure itself than the exhibitions. MUDE is housed in the former Banco Nacional Ultramarino. The downstairs showcases the vault and safety deposit area, and I felt as though I were transported back in time as I walked the exotic wood floors and saw the marble walls and brass fittings. Although I prefer modern decor and art to anything traditional, I also have an appreciation for medieval architecture—old buildings, period. Admission to the MUDE is free, and if you love fashion and design don’t pass up the opportunity to view their ever-changing exhibitions of apparel, vintage housewares, glass, jewelry, and even radios and vacuum cleaners designed by such celebrated artists as Philippe Starck, Harry Bertoia, Christian Dior, Vivienne Westwood, and Jean Paul Gaultier. 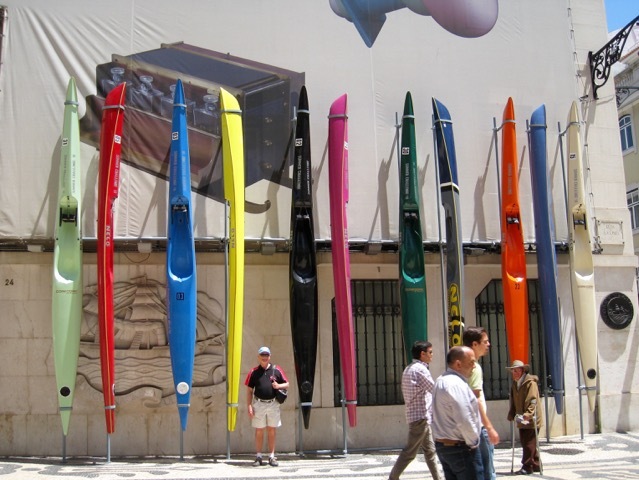 I loved the colorful kayaks in front of the museum (see photo). Not wanting to tire ourselves out too much before dinner, we wound our way through the picturesque streets toward our hotel to enjoy what I’ve been told is a Portuguese pastime—a siesta. Portugal’s reputation as one of the sleepiest nations in Europe is something to be proud of, said a local who adamantly defended the threatened tradition. An after-lunch nap is good for increased productivity, especially for artists, writers… She had my attention at “writers,” as I felt I had earned a “restful pause in the middle of the day,” as she called it. We rose from our siestas ravenous for dinner. Restaurante Eleven was created by eleven friends. The minimalist cuboid building with its striking burnt-orange facade sits atop one of Lisbon’s many hills. The inventive cuisine is Portuguese/Mediterranean inspired and changes seasonally. Seated at a table alongside the floor-to-ceiling windows, we had the perfect spot for taking in the panoramic views of Eduardo VII Park, the Tagus River, and the castle until daylight faded and the meal took center stage. You can order off the main menu or select the tasting menu or lobster-themed menu. But as much as I like shellfish, I wanted to taste a variety of dishes, so we both chose the tasting menu, a six-course meal, and included the wine pairings. Thankfully, we had shared a sandwich for lunch. Dinner started with an amuse-bouche of smoked tuna tartare, the tuna sushi grade and seasoned with a light citrus sauce. Next, “Gold Bar” duck foie gras with soya, rum, and orange. Delicious. The soup was a cherry and tomato gazpacho with lobster. The catch of the day, hake, was flaky and buttery and accompanied by a basil risotto. For the main, we had a choice of duck or lamb. We both had the lamb with lemon crust, olive gnocchi, spinach, and mint sauce. Dave helped me polish off my cheese course, but we both managed to eat dessert—pistachio crème brûlée. Our server boxed our mignardises to take with us. On our way out of Eleven, we asked to see the city lights from the upstairs deck, but a private party had reserved the outdoor space, appropriately called Twelve. One of the guests in the party overheard our request and invited us to “come up and take a look.” In all, it was a most enjoyable evening. This entry was posted in Travel and tagged Author Pat Krapf, Brainwash, castle, Darcy McClain, Gadgets, Pat Krapf Author, Saint George's Castle, thriller novel on August 20, 2015 by Pat Krapf. Day two in Beaune. I tucked a rain jacket and umbrella into my backpack and was ready to face the elements for our all-day excursion into the Burgundy wine region. We had hired a local guide for a private tour of some wineries, as well as to provide a deeper understanding of the oenology and the geology of the Burgundy region. Having lived in California for decades, we were both familiar with our local wine regions, so we weren’t new to viticulture or winemaking in general, and while Dave was well-versed on French wine production, I was not. And, I soon discovered, unlike at most wineries in California, you can’t simply stop in for a tasting and a purchase at any French winery you choose to visit. Our guide met us at our hotel, and we sped away to downtown Beaune, just minutes away. As we walked through the narrow streets of this charming town, she gave us a brief history of Beaune and pointed out significant landmarks along the way. One sight that caught my attention was a model of the Beaune ramparts, which we planned to explore the next day. We arrived at our guide’s office and settled in for an in-depth discussion on viticulture and vinification, and she was certainly a wealth of knowledge on both subjects. During the hour-long talk we tasted wines from various villages in the Côte de Beaune, which gave us a better grasp of just how important the terroir is to wine growing and how it affects a wine’s taste. The terroir is the symbiosis of grape, soil, climate, vineyard placement, and the human touch, all rolled into one. “Now we will go on the ground,” said our guide. As an avid gardener, I hoped this meant what I thought it did, and I was right. We drove through the countryside, stopping at intervals to feel the soil in which the grapes grew, learning hands-on about viticulture and how geology impacts wine growing. A side note: 95 percent of all wine produced in the Burgundy region, from Dijon to Lyon, comes from two specific grape varieties: pinot noir and chardonnay. From the Côte de Beaune region in the southern half of Burgundy, we retraced our route north to the Côte de Nuits. Ninety-five percent of the wine produced in this district is red, predominantly from the pinot noir grape. The most famous and most expensive come from the grand cru vineyards of Vosne-Romanée and Chambolle-Musigny. The remaining 5 percent is white, but the white wine mecca of Burgundy is really the Côte de Beaune region. Our first stop in the Côte de Nuits was the Clos de Vougeot, a wall-enclosed vineyard (clos) with a 125 acres under vine. It is the largest single vineyard in the Côte de Nuits that’s entitled to the grand cru designation; a wine of the most superior grade. The vineyard, like so many in the region, was created by the Cistercian monks. The land was either purchased or donated. 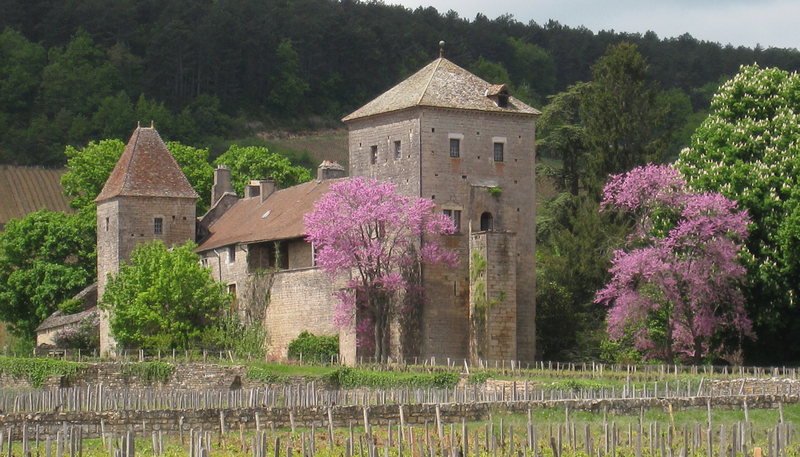 In 1336 a wall was built around the vineyard, and in 1551 a château was added. During the French Revolution, all vineyard possessions were confiscated and sold to private buyers. In 1818 the château and vineyards were purchased by Julien-Jules Ouvrard and remained a monopole until his death. A monopole (monopoly in French) is an area controlled by a single winery and can be as small as a vineyard or as large as an entire appellation. An appellation is a legally defined and protected geographical indication used to identify where the grapes for a wine were grown. Also note that, unlike in most of the world’s vineyards, single ownership is rare in Burgundy. After Ouvrard’s death, Clos de Vougeot passed to three heirs but continued to be operated as a single property until 1889, when the heirs sold and the vineyard was bought by six Burgundy wine merchants. This was the first time the land had been subdivided since the creation of the vineyard some seven hundred years earlier. 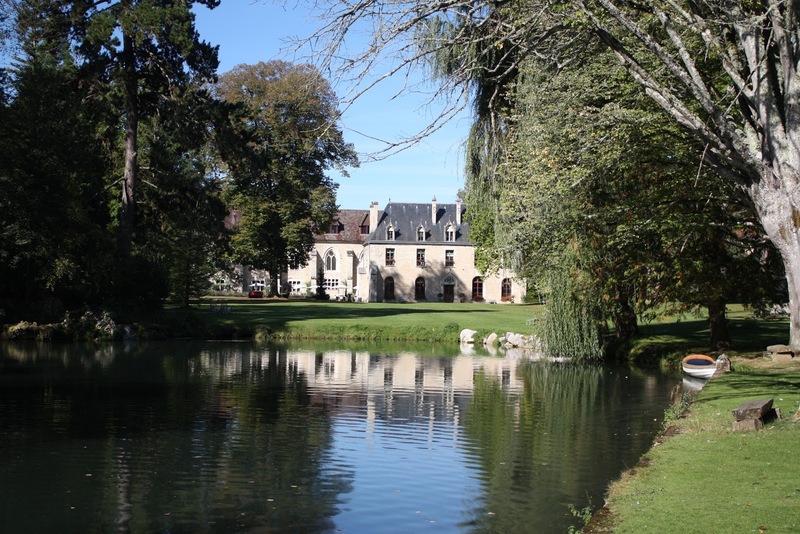 Over the years, the holdings have been progressively subdivided by inheritance or sales, and as of the early 2000s Clos de Vougeot is now split among eighty-six owners. These producers either make cuvées under their own brands, sell their grapes to vintners, or both. And with its array of owners, Clos de Vougeot is arguably one of the most diverse sources of pinot noir in the world. Next, our guide explained how much the soils can vary even within this 125-acre tract. The soils around the château are chalky and gravelly oolitic limestone and therefore have good drainage. Those in the middle part of the vineyard are soft limestone with clay and some gravel, resulting in moderate drainage. The bottom part of the vineyard is humus-rich alluvial clay and is flat, making for poor drainage. What about appellation laws and regulations for the French wine industry? I won’t even attempt to go into this, only to say the industry is heavily regulated, and some of your best fine wines are produced here, allowing you to cellar them for years. Later, when I commented on the size of Clos de Vougeot—large for the region—our guide said most grand cru sites are closer to thirty-five acres, with the average being eleven acres, so the clos is indeed a large grand cru vineyard. And after I checked prices for some of the wines produced in this region, approximately $200 to $3800 per bottle, I can see why Burgundy isn’t popping corks to draw tourists to daily wine tastings. You can, however, plan in advance and make an appointment to tour a specific winery, such as Maison Louis Latour or Louis Jadot. As I walked through the grounds of the Château du Clos de Vougeot, I was amazed by the tall, sweeping roofs that almost touch the ground, and I marveled at the giant wine presses built by the Cîteaux monks. My head was still buzzing with wine facts as we approached our last stop of the day—Gevrey-Chambertin, the largest wine-producing village in Burgundy’s Côte d’Or district. While our guide answered the few remaining questions Dave had on viticulture, I took in the scenery and soaked up some rays. The sun had finally appeared to warm the day. Late in the afternoon our guide dropped us at our hotel, and we immediately prepared for our drive from Beaune back to Dijon, about a fifty-minute trip, as we had dinner reservations at Abbaye de la Bussière. As we wound our way through the Ouche valley, the countryside picturesque and unspoiled, we were glad we had our GPS to guide us. We turned onto one, then another country crossroad and kept going until I was certain we were hopelessly lost, but we soon spotted the Burgundy Canal and knew we were on course. We followed the river, and before long there appeared before us a grand gateway. The drive curved past willow trees and a duck pond, and Shetland ponies grazed on the grass. We parked and were escorted into a main hall. Abbaye de la Bussière is a Cistercian monastery built in 1131 by Stephen Harding, an Englishman, of the Cistercian Order at Cîteaux. Following the French Revolution, the monks were expelled and the property sold at auction. It remained in private hands until it was returned to the Catholic church in 1921 to serve as a spiritual retreat. In decline and decay, the church decided to sell the abbey in 2005. 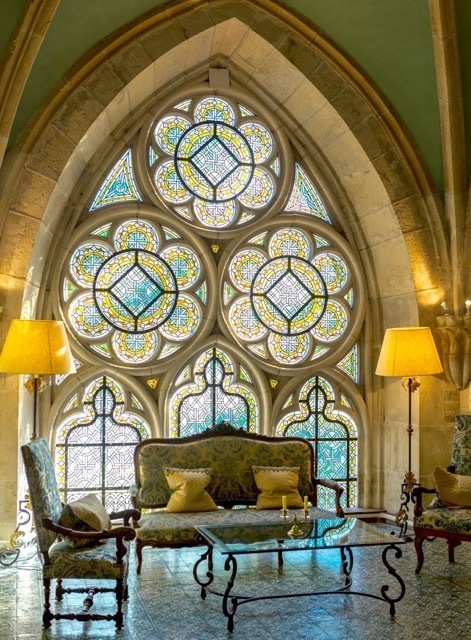 Today it is owned by the Cummings family and is an exclusive boutique hotel set on fifteen acres of parkland with a lake and a botanical garden. 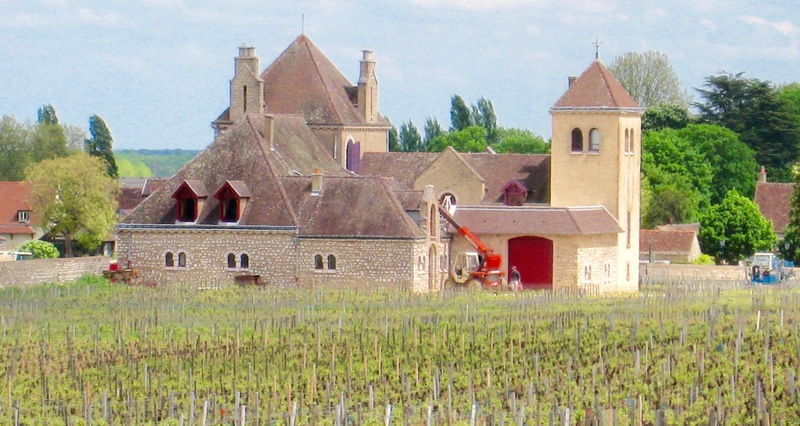 The abbey is surrounded by historic vineyards, Gevrey-Chambertin being one of them. 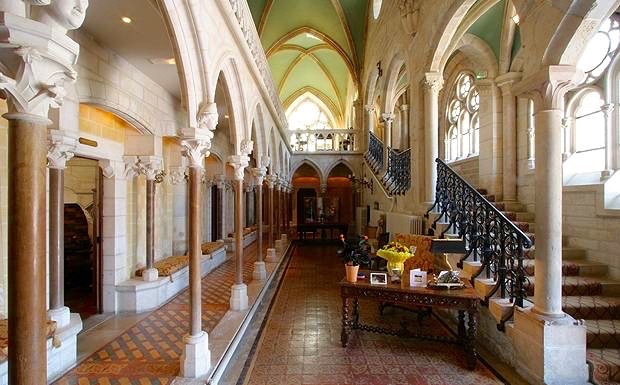 There are sixteen guest rooms, all lavishly decorated, and fine dining is in the main abbey building, a cathedral-like setting with honey-colored stonework, traceries, ornate staircases, and stained glass windows that cast soft turquoise light on the vaulted ceilings and walls. The abbey’s main restaurant is in the former refectory. Seated at a table tucked into a corner, we settled in for a most memorable meal. For starters I ordered the escargot, served with a garlic-suffused green risotto topped with goat cheese foam. It came in a tapered parfait glass, the green risotto at the bottom topped with the goat cheese foam, and in the center of the topping the escargot. The presentation was as delicious to view as the dish was to eat. Dave ordered the crayfish and smoked eel with a candied quail egg on marmalade tomato and anchovy cream. For the main course, I had trout served with basmati rice, capers, golden raisins, and herbs. The whole grilled trout was expertly filleted at our table. Dave ordered free-range pork, morels, and roasted potatoes, with a light emulsion of green pepper and rosemary. For dessert, we selected our favorite cheeses from the cheese trolley and sipped an excellent French port. As we drove away from the abbey, I wondered what the Cistercian monks would have thought of the monastery today, knowing no vestiges of their strict monastic orders of self-denial, seclusion, and silence remain today. But it was a fleeting thought, as it was obvious that the Cummings have gone to great effort to successfully restore the abbey to it glorious medieval self and are carrying on the Cistercians’ passion for surrounding themselves with peace and natural beauty, which kept the monks close to the earth of which God had made them stewards. This entry was posted in Travel and tagged Author Pat Krapf, Beaune, best new thriller novel, Darcy McClain, new thriller novel, Pat Krapf Author, Texas Author Pat Krapf, thriller, Thriller author Pat Krapf, thriller novel on July 9, 2015 by Pat Krapf. During our 1994 trip to Europe, we had reserved a day cruise down the Danube River from Vienna to Budapest, but due to a misunderstanding with the hotel concierge, the trip never occurred. Ever since, I had had Budapest and a Danube River cruise on my wish list. Now that I had seen Budapest, I was looking forward to today’s river voyage, despite the grey, chilly, misty morning. And according to the weather report, no improvement was in sight. We met our tour guide at the Intercontinental Hotel, next door to the Sofitel, and were immediately informed that the river cruise had been canceled. Evidently, the water level on the river was too low. Instead, we boarded a bus for a full-day excursion of the Danube Bend. Our first destination was the artist city of Szentendre, home to Caprice International, a diamond exchange factory that opened about fourteen years ago. We watched a film on jewelry design and viewed an exhibition of Hungarian jewelry, giving us an insight into the history of Hungary’s one-thousand-year-long culture of jewelry making. Next, we visited the showroom where thousands of jewels were on display; diamonds as well as other precious stones, and most offered for sale at special manufacturer’s prices. Our next stop was Esztergom, the former capital of Hungary from the tenth until the middle of the thirteenth century. 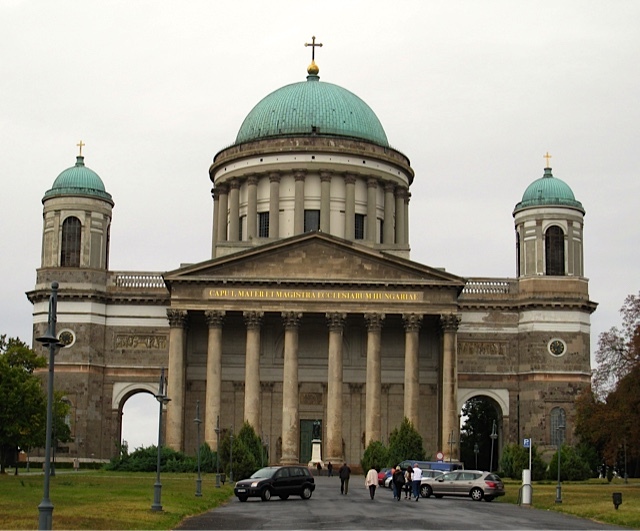 Esztergom is the seat of the Hungarian Catholic Church and home to the Basilica of Esztergom, a masterpiece of classicism, and the third largest church in Europe. 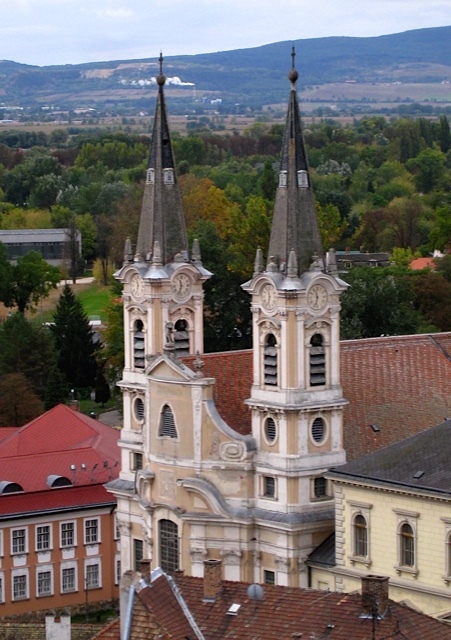 The cathedral sits on the right bank of the Danube, which forms the border with Slovakia. The grey, neoclassical basilica is colossal in size and has a central dome that is over two-hundred-and-thirty-feet high. Construction began in 1822 on the site of its destroyed counterpart, another casualty of the Turks. 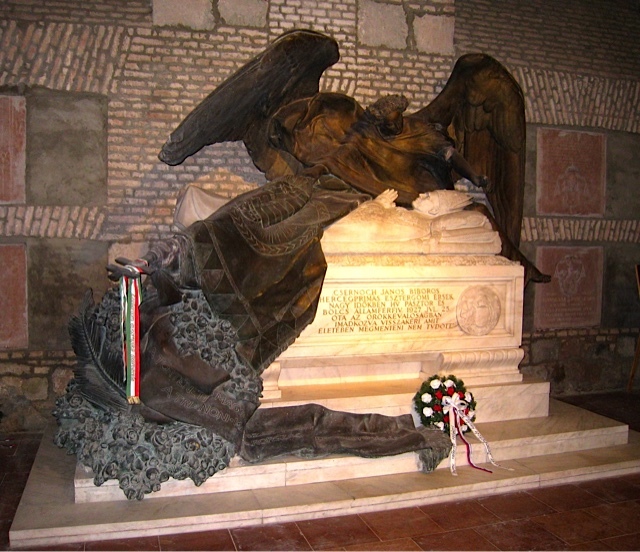 Such destruction is also evident in the smashed faces of the statue Gabriel, and the missing heads on the angels above the altar in the Bakócz Chapel. The red-and-white marble Bakócz Chapel is a splendid example of Italian Renaissance stone carving and sculpture. The copy of Titian’s Assumption over the church’s main altar is said to be the world’s largest painting on a single canvas. But I was more interested in seeing the crypt, a series of tombs guarded by monoliths representing mourning and eternity. From the depths of the cellar, we climbed to the cupola for the outstanding views of the city: a four-hundred-step hike. 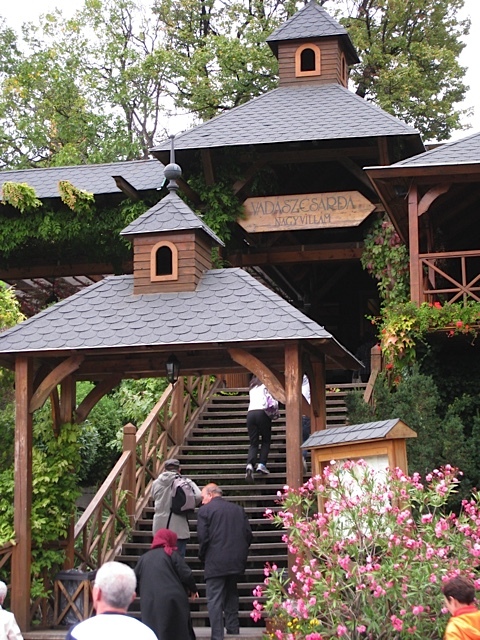 By the time we completed our tour of the basilica and the neighboring grounds, the noon hour was near so we boarded the bus for lunch at Vadaszcsarda Restaurant. On the drive, I spotted what looked like castle ruins on a hill. Intrigued, I asked our guide about them. She seemed quite disinterested in the castle and said she would give me a brief history after lunch. As far as I was concerned, I would have traded our time at Caprice International for the opportunity to explore the ruins. Our restaurant, I discovered, sat on a rise, affording an ideal vantage point for snapping photos of the castle, but this was the extent of my exploration—through a zoom lens. According to our guide, the castle ruins were actually the ruins of a military camp built on Sibrik Hill, which overlooks the Danube, in the town of Visegrád. The camp had a triangular ground plan and was built in the first half of the fourth century as one of the important fortifications along the limes: a border defense system of Ancient Rome. In the early fifth century, the Roman army abandoned the military camp. She also informed me that there is an upper castle, lower castle, and a royal palace, but I had to Google “Visegrád Castle” for the history, as the time had come to depart for the artist town of Szentendre, our final destination of the day. No sooner had we entered the riverside town and parked, it began to drizzle. In minutes, the drizzle turned to rain, sheeting down steady and fast. Those of us intent on shopping ran down the cobblestoned streets and dashed from store to store. My plans to stroll this charming town with its Mediterranean atmosphere never happened, as the rain showed no signs of easing. Disappointed, we camped out in the Dorothea Bistro Café for the two-hour duration and became better acquainted with Brad and Kat, a Canadian couple who were our bus companions. I had read that after the Turks left Szentendre, mostly Serbian refugees had settled here, followed by Hungarians, Slovaks, Germans, Greeks, and Romanians; each ethnic group establishing its own section of the town, thereby creating a versatile townscape. After scrolling through pictures of Szentendre on the Internet, and seeing the well-maintained merchant houses that encircled the main square, I had hoped to photograph a good portion of the town, in addition to some impressive riverscapes, but it was not to be. Precisely two hours later, our guide ushered everyone toward the bus and we piled on, all of us damp to dripping wet, for the drive back to Budapest. At our hotel, we changed into dry clothes and braved the pouring rain for dinner at an Italian restaurant located near the Sofitel. We retired early, for tomorrow we had a long train trip from Budapest to Prague, in the Czech Republic. This entry was posted in Travel and tagged Author Pat Krapf, Budapest, Danube, Europe, Hungary, Pat Krapf Author, Texas Author Pat Krapf, thriller novel on March 26, 2015 by Pat Krapf.